Getting to Eugene, Cascades & Coast is easy. Fly into the Eugene Airport directly from twelve major cities. The airport is only 15 minutes from downtown Eugene. If you are flying to Eugene on Alaska Airlines, remember you can check a case of wine on your return trip from participating wineries for free! Amtrak stops in downtown Eugene and Interstate 5 intersects Eugene - Springfield, two hours south of Portland. Florence is on the Highway 101 along the Oregon coast or drive Highway 126 one hour west from Eugene. To get to the Cascades, take either Highway 58 toward Oakridge or Highway 126 to the McKenzie River. 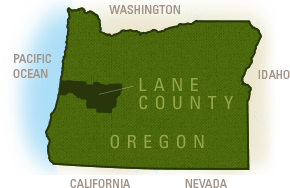 A Lane Transit District bus stops at Lowell on Highway 58 and the McKenzie River Ranger Station on Highway 126. Uber and Lyft are both operating in Eugene, and taxis are also available.